Ben Kweller is an endearingly charming, goofy, and all-around delightful showman. He began his set with "Walk On Me" off of Sha Sha which was awesome. For those that are not aware, Ben Kweller has taken a turn towards the south for his newest album, fully embracing and molding country music to the BK sound. Though the thought of country may cause some to shudder (gk), rg was "pleasantly surprised" by the new material. The effect of this new musical exploration was "not hokey", but trying to picture Kweller in a tight, button-down shirt with an eagle on it only adds to his already quirky image. The most memorable moment for rg was during the song "Thirteen" about his now wife, Lizzy. "His voice was so crisp and clear, the harmonica and piano were perfect together," rg remembers. One could not ask for a more beautiful arrangement. Hey all! 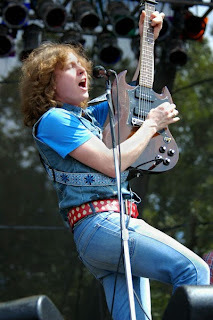 You should check out WNEW's interview with Ben Kweller- he also performs a couple of songs too!